Found on the pages of The Chicago Tribune on May 24 of 1882 . . .
Another glimpse into what life must have been like in Chicago in the years just after the fire, this concerning the house of Mr. Frank Alek. It seems that Mr. Alek contracted with Mr. W. B. R. Stephens to move the house, a common practice, especially at this time of year. At this point Mr. Stephens refused to move the house any further until the railroad came up with a settlement to pay for the damages. So there the house sat. Finally, the city brought Mr. Stephens and Mr. Alek before a Justice Wallace on a warrant. But at the hearing it was determined that there had not been sufficient time between the notification to move the damaged house and the swearing out of the warrant. The case was dismissed. Subsequently, the two men with the wayward house were served with a new warrant and threatened with arrest each day that the building remained where it was. House movers in Chicago were the best in the country, primarily because of the experience that they gained when, between 1857 and 1877, the city followed a plan hatched by an engineer from Boston, Ellis S. Chesbrough, and raised the street level. Since the street level in the city at the time was too low to dig sewers that would provide adequate drainage, Chicago raised the grade level of the streets between four and 14 feet. It was a wild, amazing scheme, but it worked. 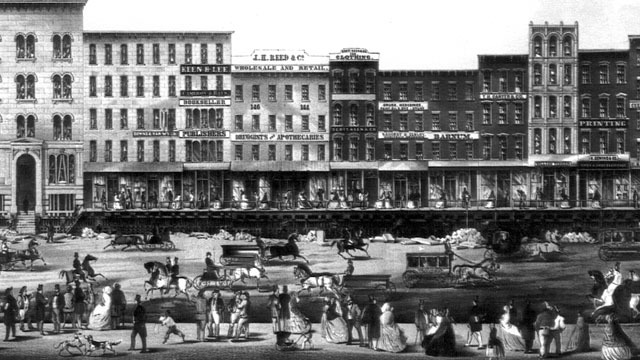 In the process, bold men, such as George Pullman, who would become a legend in the city for reasons both admirable and deplorable, acquired invaluable experience in raising and moving structures. The accounts are nearly unbelievable to us today. In March of 1860 the Chicago Press & Tribune reported, "The entire front of first-class buildings not he north side of Lake Street between LaSalle and Clark Streets is now rising to grade at the rate of about twelve inches per day. 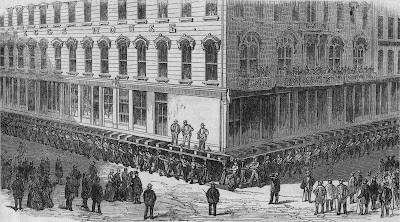 It will be at its full height by tomorrow night, when it will constitute a spectacle not many of our citizens may see again, if ever, a business block covering nearly an acre, and weighing over twenty-five thousand tons resting on six thousand screws, upon which it has made an upward journey of four feet and ten inches." That same year, 1890, 1,710 permits were issued for the movement of structures throughout the city. In that year alone 33,992 linear feet, or 6.4 miles, of building frontage changed locations. Gives a new meaning to the name "Pull"man.